Whether you are an aspiring travel guide writer, a seasoned travel guide reader or thinking about a trip to Venezuela, don’t miss this. 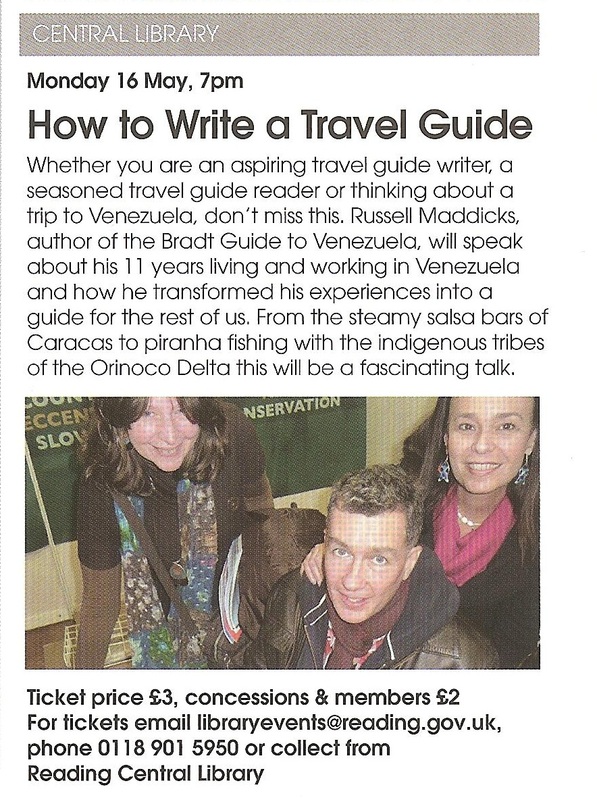 Russell Maddicks, author of the Bradt Guide to Venezuela, will speak about his 11 years living and working in Venezuela and how he transformed his experiences into a guide for the rest of us. From the steamy salsa bars of Caracas to piranha fishing with the indigenous tribes of the Orinoco Delta this will be a fascinating talk. The promo blurb says it all. I'll be giving an illustrated talk at my local library on 16 May 2011 at 7 p.m. about my many adventures in Venezuela and the process of writing the Bradt Guide to Venezuela (2011). The idea is to give an overview of the country, highlight the best travel destinations and talk about the pleasure and pain of putting it all down on paper to help others experience this incredibly diverse country. So come down and meet the author. All are welcome.